in-house, and lower your operating costs. When Should You Buy a 3D Printer? Before we launch into our ultimate guide, sometimes it helps to hear from jewelers themselves. Diamonds Inc. knows when it comes to creating custom jewelry, speed of delivery is the most important factor. Customers no longer have to imagine wearing your designs in advance. With 3D printing technology, you can print jewelry concepts, get design approval, and make your sale in under an hour. See how 3D printing has transformed this casting house and retail shop. Deciding if purchasing a 3D printer is right for your jewelry business can seem like an intimidating task. How much does it cost you right now to outsource your designs? What kind of time does it take for you to outsource production? How many models are you outsourcing per month at this point, and how many could you see your company outsourcing in the future? From a survey of customers, we’ve found a few outsourcing considerations: Many companies charge $40 for one ring in castable resin vs. a few pennies for one castable ring on any leading 3D printer. Jewelers have limited control over outsource companies’ production queues, shipping times, and broken models - all of which can set jewelers back on their customer jobs, costing time and money. Companies that offer 3D printing services could have printers with resolutions ranging from 20 to 200 micron resolution. A micron is a unit of length equal to one millionth of a meter. To put that into perspective, a single micron is a third the thickness of one human hair. These factors can greatly impact the fine details in a model, like filigree and pavé designs. Want to calculate the price point at which you should adopt a 3D printer into your jewelry business? Put your current outsourcing cost into this equation to determine the number of prints you’d need to get your return on investment. $0.12 represents the cost per printed model. 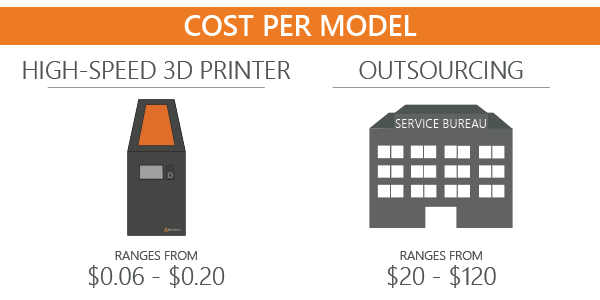 To see how outsourcing compares to our 3D printers in time and cost, check out our blog on when to buy a 3D printer. Using the old method of milling, a jeweler with two retail locations, Neugebauer’s, was faced with too many complexities. Often Mike, the owner and custom jeweler, would create a design, but the mill wouldn’t be able to produce the right results because of certain limitations. The machine didn’t present the detail he was hoping for, and he was always 3 days behind, even if he was milling all day every day. 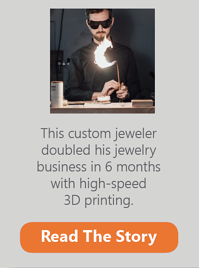 Adopting 3D printing allowed Mike to enhance his jewelry business’s competitive advantage by allowing his team to spend more time on the sales floor, creating customer relationships rather than spending hours creating models. See how Neugebauer's made the leap from milling to 3D printing in this case study. Oscar Valencia, president of a jewelry retail storefront and a casting house, came with 20 years in the jewelry business and 15 using 3D printing technology, but still hadn't found the best tool for his business. With a high production volume, Oscar's biggest concern was cutting production times to days instead of weeks. By examining the speed of different 3D printers and prep and maintenance times associated with each, Oscar found a printer that allowed him to produce 5 times the amount he used to produce in one day with a different machine. He now prints and casts models in the same day, benefiting his storefront by growing his customer base, cutting costs, and enabling quick turnaround -- and benefiting jewelers around the nation that depend on him for their own clients’ pieces. Through this plug-and-play solution, Oscar and his employees save time typically spent calibrating and zeroing their old machines that had too many moving parts and were always breaking down. See Oscar's full story: From Retail to Wholesale, Oscar's 3D Printing Solution. What To Look For in a 3D Printer? Resolution is the accuracy of the print to the CAD model, including the precision of fine details. For fine resolution, DLP (or Digital Light Processing) machines are the most logical way to go. Other 3D printer types, like FDM (filament extruder) and SLA (laser technology), can’t provide such fine details. It's like trying to draw fine detail with a thick marker, you just don’t get the results you hope for. Large scale items, though, may not demand as fine of detail, and using a high-definition printer to create these parts may be a waste of time and resources. Read more about the different technologies 3D printers use in A Beginner's Guide to 3D Printing Technology. When considering speed, you need to look at the speed of the 3D printer and the time it takes to maintain and operate the machine. Leading 3D printers vary in speed based on the technology they use. DLP printers tend to be faster than SLA (laser-based) because they are building an entire layer of a model at once versus laser-based printers, which must trace each layer of the model point by point. Additionally, it's important to see if the 3D printer you're considering requires you to recoat the resin vat with film to prevent it from clouding, replace cartridges, or calibrate the printer before each print. Each of those can take additional time that a plug-and-play printer will not. It's important to not only consider your upfront costs with a 3D printer, but operating costs in the form of consumables like resins and resin vats, service contracts, maintenance fees, and more. 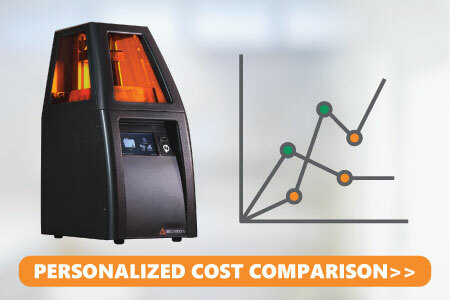 To get a cost comparison between 3D printers (or 3D printers compared to outsourcing or milling), see our Total Cost of Ownership Guide. Want to see the full list? Read Features to Look for in a 3D Printer. The solutions that B9Creations has offered to business owners have transformed the operations and throughput in many phenomenal ways. Take a look at two of our case studies that highlight these transformations. Trevor Vipond, owner of Hewn, uses 3D printing in a high-end retail shop during the day and in his own custom jewelry business at night. 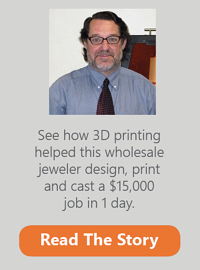 Frank Kapplow, owner of Delmas Diamonds and Jewelers, bet on 3D printing to keep his wholesale business thriving. But how does 3D printing accomplish this? And how can it bring these benefits to your business? In short, the speed, low cost, and speed of production are primary driving forces. What would you think of having a model ready for try-on within 15 minutes? With high-speed prototyping resin, customers can choose a design that fits their needs. While they go grab a cup of coffee, you can get the printer up and running to have a product for them to see, feel, and wear by the time they get back. Take an in-depth dive on your business growth with 5 Proven Ways 3D Printing Can Grow Your Jewelry Business. According to a recent survey by The Knot, the top two reasons people listed for selecting a retailer from which to purchase a ring were: first, friend/family recommendation, and second was the ability to customize. Both reasons were listed as very influential by more than 50% of respondents. Consequently, the increasing importance of customization becomes clear; it now accounts for more than 40% of the bridal market. To break that down, 15% of sales are completely custom, and more than a quarter consists of at least some personalization, as reported by MJSA. 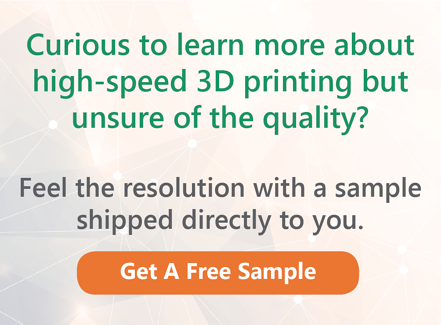 With high-speed 3D printing, castable models print quickly, too, without sacrificing surface finish for speed. An entire build table of rings can take as little as 45 minutes, and leave a super clean burnout with zero ash. Perhaps the biggest financial gain that can promote business growth comes from reduced overhead simply by printing your own models. But before we get to that, let's hypothesize for a moment and look at the effects of outsourcing model printing. Aside from time, consider the costs of having another company print your model, as shown below. This data factors in costs such as shipping, cost of services, return shipping, and other factors, depending on the company. What does a model cost to print on a DLP 3D printer? $0.12 on average. Even at the average cost of $40 per model, you’re saving hundreds of dollars every week (not to mention the time lost to shipping, as well as waiting in a service bureau’s job queue). Having a printer in-house allows you to save a significant amount of money, especially when you produce ten or more models a week. 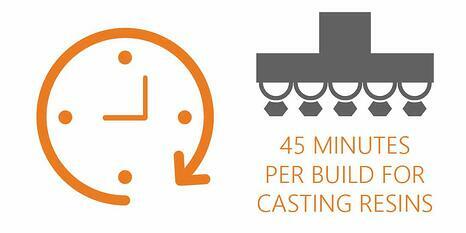 See our full guide on Reducing Your Jewelry Production Costs with 3D Printing. We understand a 3D printer is a big investment, but at that rate, the machine pays for itself after 250 rings, assuming an outsourcing cost of $40 per model. Imagine printing your castable models in less than one hour. How would that change your business? 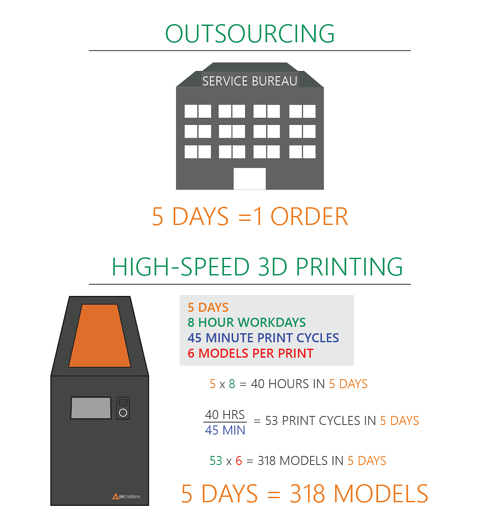 If you bring 3D printing in-house, in the time it takes an outsourced model to get back to you (5 business days on average), you could print 53 separate models or even as many as 318. See our example below. Owning a 3D printer will ensure that your customers are receiving their custom jewelry as fast as possible. Learn the Top 3 Ways 3D Printing Can Help Serve Your Jewelry Customers Faster. The truth is, cost savings is one of the greatest benefits that it offers, but certainly not the only one. Let's start with the protection of intellectual property. Nearly every jeweler who has outsourced their designs knows the concern regarding intellectual property. With no real protection in place, business owners are taking a risk in sending their designs or their customer's designs to other companies for printing. 3D printing prevents this, protecting your livelihood, reputation, and designs. What Do I Bring In-House First? As much as 3D printing has transformed the jewelry industry, it has also transformed the design process as well. Bringing 3D printing in-house allows you to print more than just your own models, and it drastically reduces the time required to produce them. This is one of the best and most effective options to help boost the efficiency of production. But between CAD and casting, it's hard to know what to bring in-house first. Book time with a B9 Representative, and we'll walk you through the process that fits your business best, drawing on our global network of master jewelers to answer any questions we can't! We mentioned before that you can print a ring model in less than 15 minutes. This allows a customer to choose a ring design, see, wear, and feel it, which makes it useful for design verification - and closing the deal. This way, you can make a sale over lunch, not over night. With the additional protection, customization options, cost savings, and time reduction, customers can be assured that their time and investment is being well placed. As a result, this allows you to provide a custom jewelry model on the same day, helping to create a meaningful experience for both the seller and the buyer. Discover how Meghan Proctor, an award-winning jeweler, repeatedly serves her life-long customers, and gains celebrity clientele at the same time. Overall, bringing your production in-house provides essential benefits that help provide customers with the great experience that every jeweler wants to give them, all while saving time, and money. See our full list of Why to Bring Your Jewelry Production In-House.